The most important basketball matches on day 3 involved Poland and Ukraine from Group B and Group A respectively. Both teams needed to win to stand a chance of advancing into the Qualification Round. Poland made things difficult for themselves from the start against the Slovak Republic and never recovered from their poor start. The Slovak players opened with a 11-2 run and stayed in front the rest of the way to win (60-52). The result meant that the calculators were not needed to determine the outcome of Group B. The Slovak Republic and Greece join Spain in the Qualification Round, while Poland must fight for Division A status. Likewise in Group A, Ukraine failed in their quest for victory against Serbia (61-73), leaving the road open for Belarus and Serbia to join the Netherlands in the next phase. With Hungary already eliminated before playing France, the match was of no interest in terms of the U20 European Championship for Women Division A. However both sides took the match seriously. Hungary had their largest lead (14-9) with a minute to play in the first quarter. France dominated the second and third quarter (40-21) before the game fizzled out during the final quarter. France won the match (62-45). 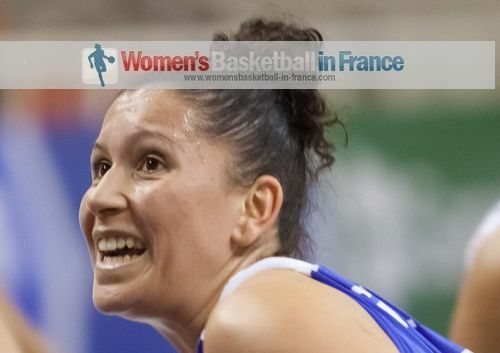 With Sara Chevaugeon having an off-shooting day, it was Margaux Galliou-Loko (in picture) who took up the challenge with a game-high 18 points for France. A year ago Francesca Dotto (in picture) explained to WBBIF when Italy survived the relegation round that she would not like to experience such stress again in a competition. She has been on fire since the start of this tournament. Her game winning shot against Russia gives Italy an advantage during the Qualification Round. It was not an easy game for Italy. Russia finished the first quarter with a 16-2 run for an early lead (19-9). Italy battled away with Elisa Penna doing more of the offensive work to jump ahead (34-32) by the end of the third quarter. 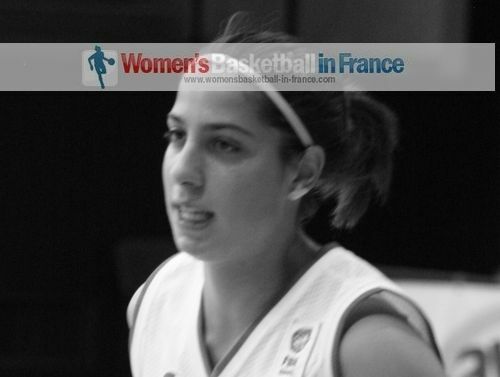 Dotto was active offensively in the final quarter and scored 9 points to help Italy to win. She finished the game with 14 points and 5 steals. From Group C, France go into the second phase with maximum points while Italy take on win while Russia start with nothing. Turkey are enjoying the support of the home fans as they continue in their demolition of their opponents. They did not wait long to knock out Lithuania. By the end of the first quarter it was (21-9) and the contest was over. Turkey won (81-44) with 11 players scoring. 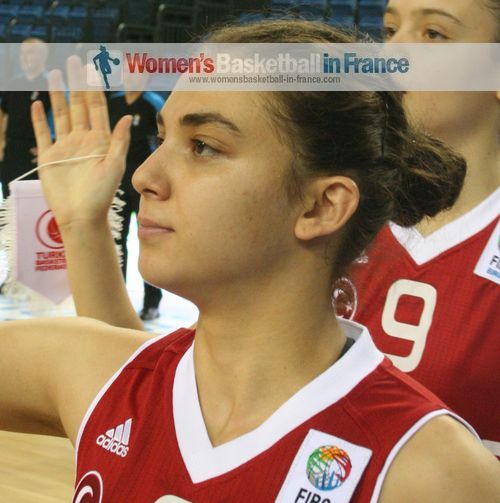 Pelin Bilgic (in picture) led the scoring with 12 points while also picking up 4 steals. Turkey and France meet each other in the last match of the Qualification Round live on TBF TV at 20:15 (19:15 CET) on 10 July 2013. In the other game in Group D, Sweden beat Germany (74-65) to claim second place and the important point for the next phase. Sweden's team is very balanced with many players able to score. This time it was the turn of Elin Gustavsson to lead the scoring with 18 points. For Germany, Laura Hebecker top scored with 19 points. Aleksandra Stanacev (in picture) poured in 20 points and dished out 8 assists for Serbia in their victory against Ukraine (73-61). Her team-mate Natasa Kovacevic led the scoring with 21 points in a match that Serbia led from start to finish. For Ukraine who are eliminated from Group A, Oleksandra Chek's double-double (20 points, 10 rebounds) and Miriam Uro-Nile's 22-point efforts were in vain. However the drama in Group A came with Belarus beating the Netherlands (63-55). Belarus hit 4 three-pointers during the final quarter walloping their opponents 21-10. What this result means is that the Netherlands, Belarus and Serbia all go into the Qualification Round with one win each. In Group B, Spain completed the first phase in perfect harmony with a comfortable victory against Greece (75-49). By neutralising the offensive threat of Greek international Artemis Spanou (13 points) during the second half, Spain had an easy run 41-21. 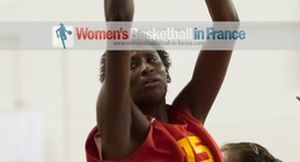 Astou Ndour (in picture) who played for just 23 minutes led the scoring once again for Spain with 23 points. The Slovak Republic led from start to finish against Poland to ensure their place in the next phase (62-50). Leading (11-2) with less than three minutes played, the Slovak Republic had no problems in holding on the rest of the way. Sabína Oroszov knocked down 21 points while the hard working Barbora Bálintová finished with 12 points and 6 assists. Spain, the basketball Queens of Europe, attack the Qualification Round with maximum points while the Slovak Republic are a game behind and Greece are just happy to be in the best 12 teams of 2013.